For the teams that finish bottom of their EuroBasket Women qualification, the Olympic dream will be over. Instead they will have to fight to remain in Division A.
Finland suffered their fifth successive defeat in Group C against Turkey and must now beat Hungary by 18 points in their next game to move off the bottom of their group. Turkey ended any chance of Finland having a direct qualification with a comfortable victory (89-64) with Mehtap Gezer leading the scoring with 18 points. Turkey require one more victory to be sure of a top 2 finish and qualification. Bulgaria moved one step closer to retaining their Division A status in beating Hungary (78-71) with 24 points coming from Donneka Hodges. Bulgaria are currently third with 3 wins and 3 defeats. In Group D Ukraine are not having a good time, they fell for the third time in three games. This time they lost to Great Britain (49-57). Germany beat the Slovak Republic in overtime (63-58) to set up a three-way tie for first place in the group. Linda Fröhlich was again the leading player for Germany with 19 points and 18 rebounds. Italy improved their chance of qualification by beating Belgium (67-57). Italy, playing at home, trailed (39-44) going into the final quarter and only drew level with about 6 1/2 minutes with Chiara Consolini (16 points) scoring from the charity stripes. Giorgia Sottana (12 points) then sparked an 8-0 run that put the hosts in charge as they made up for their road defeat to Belgium. Ann Wauters and Kathy Wambe scored 17 and 15 points each for Belgium. Belgium remain 4th in their group. Gintare Petronyte fired in 22 points as Lithuania beat Croatia (81-63). Lithuania require just one more victory to book their tickets for EuroBasket finals in Poland. Croatia, Italy and Belgium are locked together in the battle for the second qualification. 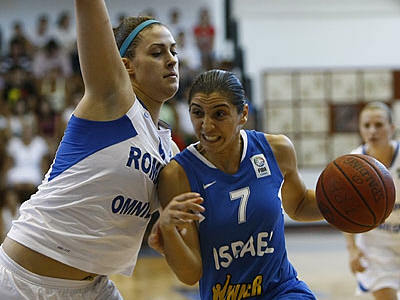 In Group B, Romania got 30 points from Gabriela Marginean and 28 points from Maria Pascalau but ended up losing in a tight finish to Israel (79-83). Shay Doron and Liron Cohen (pictured No. 7) with 27 and 18 points respectively held together their side for victory number three to stay on top of the group. Serbia beat Latvia in the other group game (75-63). Biljana Pesovic and Ana Dabovic scored 18 points each for Serbia.